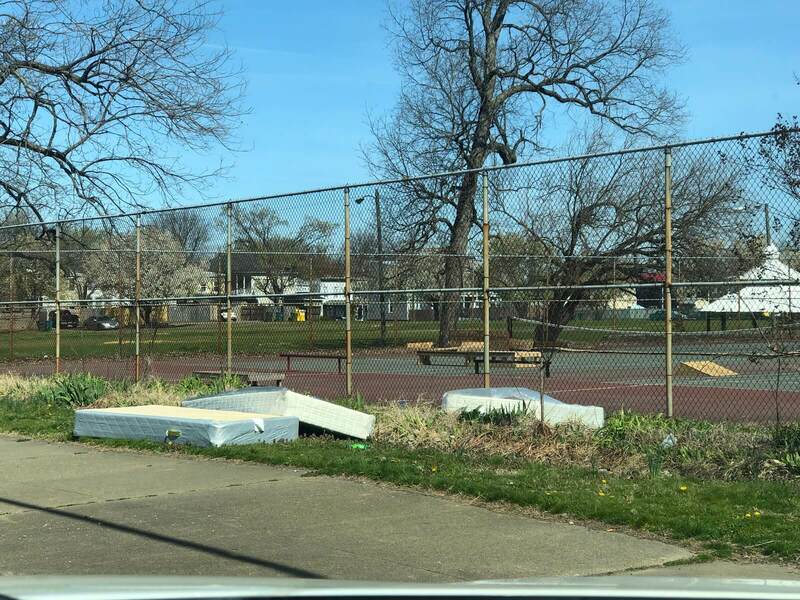 Illegal dumping is a problem throughout Richmond with more illegal dumping sites in district 7 than in the whole of all the other districts. It’s time for spring cleaning and people are hard at it. The debris in the featured photo showed up on school property at 29th and M Streets. And recently a delivery was made to the sidewalk near the intersection of Mosby and Venable Streets. For anyone who may be a bit confused, like I am. The dump (landfill) aka “East Richmond Road Convenience Center” is open for Only small appliances and bagged refuge (not regular food garbage). NOT ACCEPTED for regular dumping: furniture / large appliances / heavy refuge / construction dumping / bulk tires. The items mentioned above used to be accepted in that part of the dump which is now closed due to damages by the 2011 earthquake and $2-million is needed to fix it but has never been approved – hence the petition. I don’t quite understand how opening the dump will help clean up the dumping incidents here. Having a dump closer to you will not make your car magically big enough to transport a mattress/couch. I think any efforts would be better spent educating people on trash services in the city. First – you call the city for a bulk trash pickup. Then, you put your stuff out. Then it’s picked up. Not hard. The east end dump closing has nothing to do with people not understanding bulk trash pickup. @MP Thanks for the feedback. This was a user-submitted article. The new website will have a space for these so they don’t look like “features”. Right now everything looks like a headline, whereas in the new site you’ll see more varied articles being siloed into their own sections. This will give you an opportunity to see change.org types of content if you choose to follow it. That place is a pain. They’re not setup to effectively work with residents. I wish the city would just work out a deal with the county instead. Charles City road convience center is a well-oiled machine. The East End “dump” was/is a collection site, so it’s not like there would be a new “dump” in the neighborhood. I’m all for opening this site for collection again. Of course everyone can’t use it, but right now you have to travel south side to dispose of trash like this. This is a basic service provided by local governments and Richmond should be providing this service. 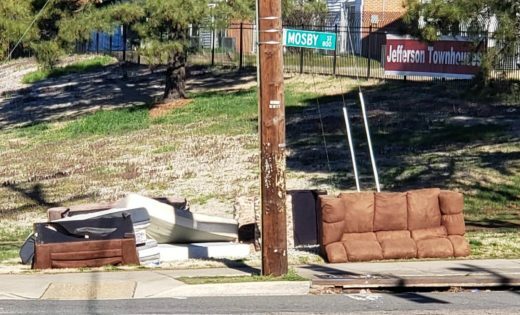 It’s not a cure all for illegal dumping, but it certainly contributes to the problem in our area. The people that are dumping this stuff could care less if the “dump” would take it. Their thought process makes it OK to dump garbage, debris, fast food wrappers etc. on other peoples property. I participated in one of the first “alley rallies” in Church Hill and I will NEVER forget the woman that just threw her dirty diapers out of the second floor window. The pile was three feet high! Opening the dump will not affect or change this issue. Possible solution: Once a week, every week, the City puts out two dumpsters in various locations throughout the East End. Folks will use them (as is evidenced by any time a commercial dumpster is placed near a construction site). The cost would be a lot less than re-opening the dump, and those who live along the route to the dump will be spared the constant barrage of trash that blows from trucks heading to the dump. What agreat idea. It is thoughtfull and creative. This should be the petition and I will be the firts to sign it! Agree SA Chaplin – great idea! I think that would really help. It is correct that if one wants same day service it is $100 and applicances is $50 all the time. but for other bulk times like mattresses that is not true. Previously, bulk and brush items were collected only upon request. The City modified the bulk collection program to provide BI-WEEKLY collection year around and mirrors the recycling collection schedule. See, City Code 11-103.